Note: This article is a sidebar to this issue's feature story, "Taking to the Trees." 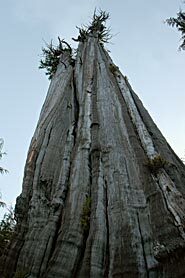 They're like a new frontier," Sean O'Connor says, speaking about the gigantic trees he climbs, "because no other humans have been up there." O'Connor is the photographer for the Ascending the Giants expedition team, which seeks out, climbs and measures the nation's biggest trees. O'Connor's introduction to the team was "trial by fire," he says, laughing. "The guys sent me up a 342-footer. Everything came out all right, obviously." 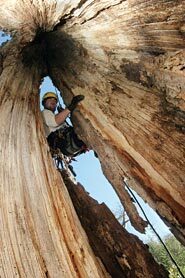 Oregon arborists Brian French and Will Koomjian started the project in February 2007, with the twin goals of climbing the giants and updating state and national big-tree registries. O'Connor has been with the team since the project's inception, and videographer John Wallis joined in August 2007 to help document the effort. Team members use non-invasive climbing methods and equipment, and work to raise awareness about the importance of trees to our ecosystems. French's fascination with trees is lifelong; at the age of 22, he became one of the country's youngest certified arborists. "It's life-changing, to climb a tree," he says. "When you get someone up into a tree, in contact with it, people aren't the same afterwards."